Driving around in the 2018 Toyota RAV4 Hybrid is a real treat. Between its spaciousness, its attractive and comfortable amenities, and its host of high-tech features and systems, this hybrid compact SUV’s cabin is practically one-of-a-kind. 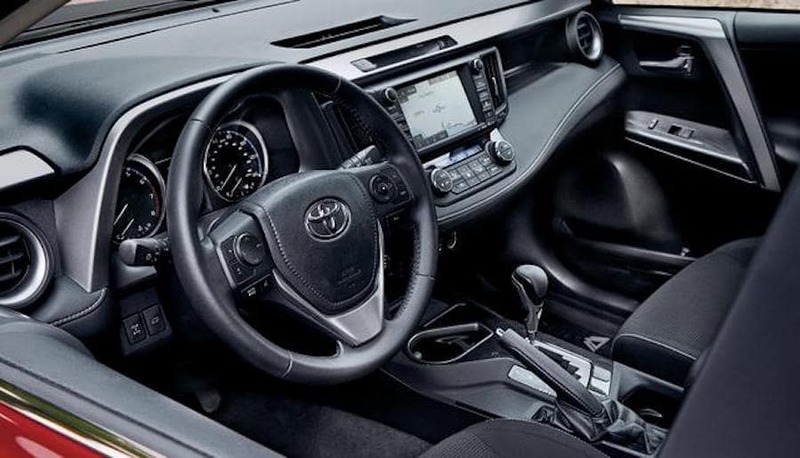 That’s why our Andy Mohr Toyota team created this interior review. If you have any further questions, please don’t hesitate to reach out to us, especially if you live around Avon, Plainfield, Indianapolis, or any of the surrounding Indiana communities. Schedule your test drive! We’ll start off with a quick glance at just how much room you, your family, your friends, your pets, and your things will have inside the new Toyota RAV4 Hybrid. Check out these tables because numbers talk. Now that you have a better sense of how much room everybody will have, let’s dive deeper into some of the other important questions. What does the cabin look like? What does it feel like? Front Seats. The front seats of this compact SUV are all decked out. Not only can they come in SofTex®-trim, but you can make them power-adjustable and heated, too. Now that’s both luxurious andrelaxing. Power Moonroof. Nothing improves the insideas much as bringing in some of the outside. And that’s just what you can do with the RAV4 Hybrid’s available power tilt/slide moonroof. However, if you’re driving around during the day and the sun’s getting too bright, just slide the sunshade shut for a very easy fix. Furthermore, the entire cabin was engineered with a driver-centric approach. The buttons, knobs, and user interfaces are all laid out completely intuitively, so you’ll feel like you’re right where you belong. Integrated HomeLink®: Control your garage door, front gate, home security system, and more. Integrated Navigation: Now, you’ll have as much help as possible arriving at your destination. Two Available Audio Systems:Choose between either Entune™ Premium Audio or Entune™ Premium JBL® Audio featuring JBL® GreenEdge™ speakers. Both offer SiriusXM® Satellite Radio. Siri® Eyes Free: Harness the power of your compatible iPhone®, with voice-recognition. If you’d like to learn more about the entertainment and navigational capabilities of the Toyota RAV4, we’d be happy to help. We’d also be happy to get into its peace-of-mind-promoting safety tech. Test drive the 2018 Toyota RAV4 Hybrid today at Andy Mohr Toyota! But, at the end of the day, the best way for you to get to know a vehicle’s cabin is by test driving it for yourself. Luckily, you can do that near Indianapolis, Plainfield, and Avon with Andy Mohr Toyota! Simply call us on the phone, chat with us on our website, or stop by our showroom as soon as possible.